When these recommendations are finalised in the next few months and sent to the Department of Health, policy will probably change to a recommendation of a supplement of 10µg/day for the whole population over 1 year of age. For infants an intake of 8.5-10 µg/day is likely to be recommended. This would mean a supplement from birth for breastfed infants as breastmilk does not contain this amount. Why are supplements necessary for the general population? In other countries, such as Finland, Canada and the USA, a wider range of commonly consumed foods are fortified with vitamin D, such as fresh cows’ milk, other dairy products and some fruit juices. Breast milk is low in vitamin D, and young infants depend on their fetal stores of vitamin D laid down during pregnancy. Hypocalcaemic seizures and tetany early in life, although rare, results from low fetal stores due to maternal vitamin D deficiency. Season – sunlight of the critical wave length only reaches the UK between April and September. It is absorbed by the atmosphere during winter months. Latitude – in the south of the UK there is more sunlight of the critical wavelength than the north. Weather – more vitamin D can be synthesised on bright sunny days than on cloudy days. Air pollution – reduces the critical UV light waves available for skin synthesis. Time of day – more vitamin D is synthesised when sunlight is most intense in the middle of the day compared to early morning and late afternoon. Colour of skin – darker skins require more time in the sun to synthesise the same amount of vitamin D as light skins.3 Those of Asian, African and Middle Eastern ethnic origin are more likely to have lower vitamin D levels than Caucasians. Lifestyle – time spent outside with bare skin exposed facilitates vitamin D synthesis, which is greatly diminished when most skin is covered by clothes, as can be the fashion or in the case in girls and women with certain religious and cultural traditions. Sunscreen use – It blocks dermal synthesis of vitamin D.
Deficiency is usually accompanied by normal blood levels for calcium and phosphorus, highnormal or elevated levels of parathyroid hormone (PTH), normal to elevated levels of total alkaline phosphatase, a low 24-hour urine calcium excretion rate, and low levels of total 25(OH)D. Patients with severe and long-standing vitamin D deficiency may present with overt hypocalcemia and/or hypophosphatemia, but this is the exception. Vitamin D: vitamin or hormone? The ultraviolet rays of wave length 290-315nm convert 7-dehydrocholesterol in the skin to previtamin D. This is metabolized in the liver to 25-hydroxyvitamin D (calcidol), which is a stable metabolite with a half-life of 2-3 weeks. It is converted in the kidney and select other tissues by the action of the 1á-hydroxylase enzyme to 1,25-di-hydroxyvitamin D (calcitriol), the active form which interacts with vitamin D receptors found in all cells. Hence, vitamin D could be more accurately called a steroid hormone. It is fat-soluble and stored in adipose tissue or fat deposits when dermal synthesis and dietary intakes exceed daily requirements. Stores are used during the winter months when the critical wavelength in sunlight is insufficient for dermal synthesis. are on certain medications, such as statins. Vitamin D2 (ergocalciferol) provided by some supplements and found in very small amounts in mushrooms. Both forms are metabolised in the same way, but the 25 hydroxyvitamin D3 has a longer half-life than 25 hydroxyvitamin D2. Hence supplements of vitamin D3 are considered more beneficial than supplements of vitamin D2. Both tablet and liquid form are available in pharmacies and supermarkets. Patients should be advised to buy Vitamin D3 supplements from brands sold in pharmacies as these have reliable quality control standards, e.g. Baby D, Boots, Colief, HealthAid, Vitabiotics, Wellkid. 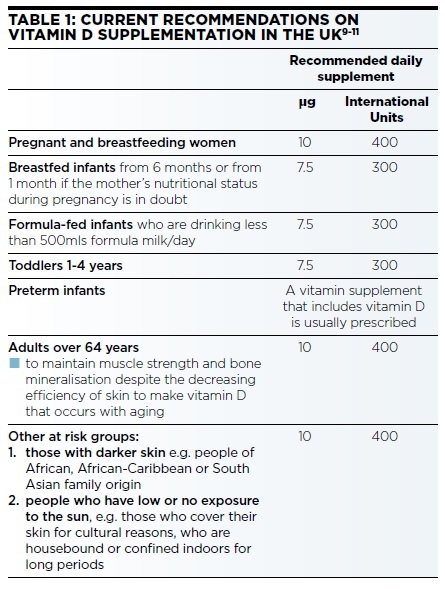 Most multi vitamin supplements for infants, children, adults and pregnant and breastfeeding women sold in the UK include vitamin D along with other vitamins, but the vitamin D content varies and may not meet the recommendation. Three brands of vitamin D only supplements (Desunin, Fultium and InVita) are licensed for prevention (Table 2). Excess vitamin D taken as supplements could have detrimental effects on health. Prescription supplements of high doses for the treatment of diagnosed vitamin D deficiency are listed in the BNF and BNFC. Some NHS areas have treatment protocols to follow. Judy More works freelance and is a member on the Colief Expert Panel. 5. Dror DK. Curr Opin Obstet Gynecol. 2011 Dec;23(6):422-6. 6. Bodnar LM, Catov JM, Hyagriv NS, et al. J Clin Endocrinol Metab 2007;92:3517e22. 10. Department of Health (1998) The Stationery Office, London.